This entry was posted in ADC and tagged A/D-converter, analog-to-digital converter, efficiency, energy, figure-of-merit, FOM, linkedin, power, state-of-the-art, survey. Bookmark the permalink. 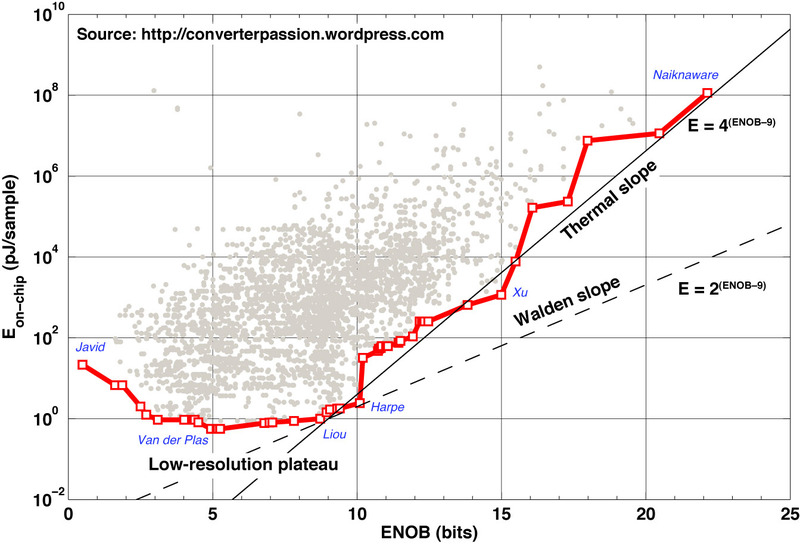 Regarding the low-resolution plateau, I think the process instead of the thermal noise will be a fundamental limit on the energy efficiency. That is to say, the C may refers to the minimum capacitance of a transistor in a process, and then the total C is architecture- and application- dependent. What’s more, most of the low-ENOB ADCs are particularly for high-speed applications, which indicates that power cost could be higher to achieve fast speed compared to moderate-ENOB/speed designs. I believe like you, that the really low ENOB comes from ADCs which target much higher sampling rates (like tens of GSPS), and then the linear power model suggested by Es = P/fs is not really valid. I’ll try to see if I can dig up empirical support for that, and I believe I can.